Beijing’s smog problem has become an international issue this year, with reports of canned air being sold, a ban on BBQs and even talk of moving the capital from Beijing to escape the fumes. What can be hard to get across is exactly how much the smog changes the day-to-day life in the city. This photo, taken by Reddit user BananasUnited, shows the difference between a “clear” day, with a AQI of less than 500, and a smoggy day, with an AQI of more than 500. AQI stands for Air Quality Index, which technically only goes to 500. 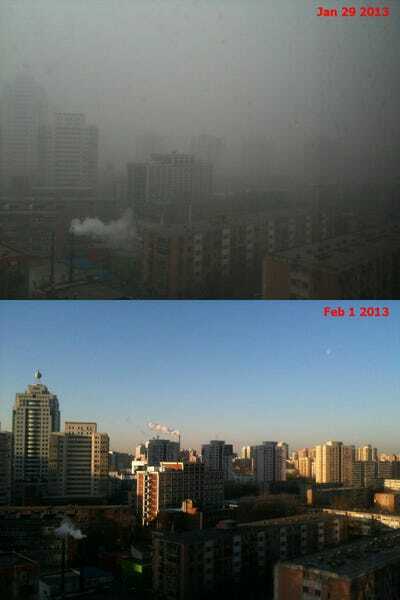 On January 29th, however, Beijing’s AQI reached 517.